Merion Mercy Academy Health Services Program consists of a team of health professionals including a physician consultant, two health room nurses, and a Lower Merion School District certified school nurse. The health office is staffed full time to provide first aid and support to students who become ill or injured during the school day or who need health maintenance of a chronic or acute medical condition. If further treatment is required or a student needs to go home, parents will be contacted. In the event of an emergency, 911 will be called and the student will be transported via ambulance to the hospital. It is important that your child have up to date emergency information for the health and safety of the student. Please provide the school with any changes that we should be made aware of in case of an emergency. All students will be given the emergency information form the first week of school, please provide your child with any changes you feel we should be made aware of by September 7, 2018. We request that you contact the school nurse if your child has any health concerns including current medical diagnosis, allergies, or pertinent health history. Please update the Nurse’s office with any changes in your daughter’s health throughout the school year. 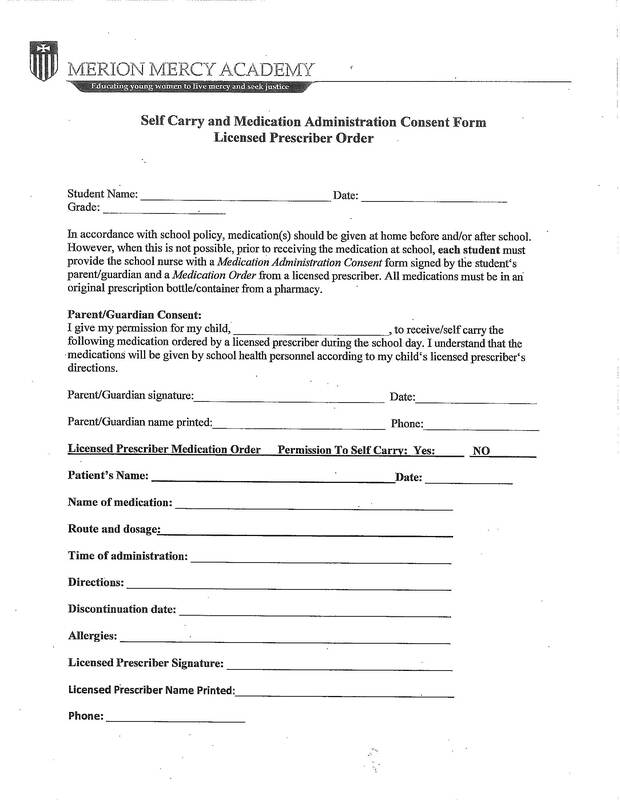 Pennsylvania legislation requires that all children in any grade, including all public, private, parochial, intermediate unit and home schooled student, show proof of immunizations at registration before they can attend school in the State of Pennsylvania, unless exemption for medical or religious reasons is granted. In addition, a completed medical history form and emergency information form will need to be completed. ELEVENTH GRADE STUDENTS AND ALL NEW OUT-OF-STATE/COUNTRY STUDENTS ARE REQUIRED BY PENNSYLVANIA SCHOOL CODE LAW TO HAVE A COMPLETE MEDICAL EXAMINATION PERFORMED BY A FAMILY DOCTOR OR, IF THIS IS NOT POSSIBLE, BY THE SCHOOL PHYSICIAN. All students receive mandated health screening examinations in accordance with the Pennsylvania School Code. Please feel free to contact the nurse's office with your questions and concerns regarding medical issues with students. Mrs. Katie Horgan, R.N., B.S.N.